Listen to "The Library Book" on your iOS and Android device. Very slow beginning but well worth the patience! I love non-fiction ! This specific one has beautiful language. I love the weave of a detective mindset! My husband and I both recommend this great book! This book was like a love story to your local library. 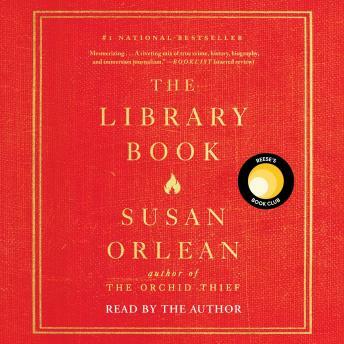 Susan Orlean begins her book discussing a tragic fire that decimated the LA Central Library. What follows is a prolific history of the library and its role in the diverse and changing LA landscape. My first book from Reese Witherspoon’s book club. This was so far less dull than I imagined! Really enjoyed it. I miss it!! I carried me through quite a few plane rides. This book was a bit of a slog. The reader/authors voice is a little droning, but ultimately I found the topic interesting. I almost stopped & debating not finishing, but I’m glad I did. I feel as though I learned a lot & renewed my appreciation for our public libraries & librarians. I tried to get into this book. After listening for over two hours, I just could not do it. very boring subject matter and bland narration.